First boil water with salt and when water comes to boiling point, and then add rice flour. Then mix, stir, cover it with lid and turn off the heat. And rest this under closed for 15 minutes. Now knead well the dough with 2 and ½ tsp oil. And then divide the dough into 4 and knead each dough well to make it smooth and soft. Then roll each ball out on a rolling pin to make a thick flat bread. If you want to brush some oil and water over the flat bread. 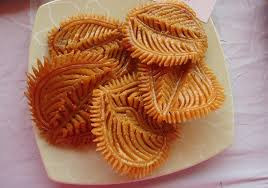 Now cut and design shape with tooth pick.And with off cut you will ad be to make 3 more Nokshi Pitha”s, so this recipe will makes 7-8 Nokshi Pitha”s. And now put all pitha under air for 2-3 hours. And if you want to store sun dry it for 5-6 day and put into airtight container till you want to fry them. Make syrup with sugar/date jiggery and ½ cup of water, keep it aside. Then heat oil for deep fry and when oil is ready fry each Nokshi Pitha on medium heat till it becomes deep golden brown. Now remove pitha from oil and put into syrup for 5 minutes. Finally serve this Nokshi Pitha any decorated plate or bowl.